This is a series of pieces through the years focusing on New Zealand. New Zealand stories from 2003-2013 beginning with a tour around the country during the premiere of "The Return of the King" the last "Lord of the Rings" film. 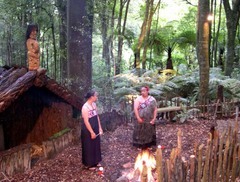 That tour also included a soundscape of a Maori Village and a feature story on a Maori hip hop group. The most recent piece features a Black Grace, an NZ dance troupe.